The ayes (I mean, the eyes) have it. And, yes, a pun is intended. These innovative sunglasses are definitely hot (as in a sunny day) and are product review keepers for sure, according to my own four very opinionated California trend-setting tween experts. Actually, when we first heard about this review opportunity, my family was as happy as I was to be asked to "test drive" and comment on the current Eyes Cream Shades line of sunglasses for kids. I have to be honest, though. I was clueless about what to expect, really, with all the children's sunglasses that are on the market today at every price point ranging from the dollar store variety to the high-end designer shades that cost hundreds of dollars. When the box of stylish eye accessories that owner Faith Smith hand selected for us to try out did arrive, though, we were stoked and my two sons and two daughters couldn't wait to pose for the photos you see in this review. Luckily, Faith, whose company is based in Southern California, sent us five different styles from her fun ice cream-flavored Eyes Cream Luxury Blend line for kids ages 8-12. And, each my kids -- triplets (age 12) and big brother (13) -- chose a different pair out of the box that fit their individual style as well as their darling faces. Thanks to Eyes Cream Shades, there was no fighting over new things like there usually is. The delicious "flavors" we received in our package included Vanilla Frame, Blue Vanilla, Chocolate, Malted, and Licorice Ice, and did they ever look yummy. The kids' one-word reactions after trying them on, in order from oldest to youngest were: "Awesome," "Cool," "Fashionable," and "Radical." Each pair of glasses varied but all featured the brand name on the outside right temple and each was constructed of plastic frames that look very sturdy. 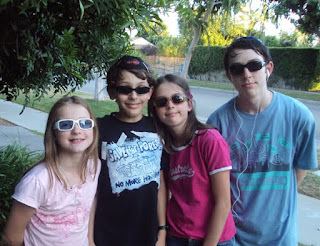 Simply stated, my kids were thrilled with the trendy style choices and fit of these sunglasses and they give all the products sampled for this review their Tween Seal of Approval. As a Mom, I just love the look of this brand, too, since I don't want my kids looking like geeks. But, seriously, as a parent there is something more that I am looking for and Eyes Cream Shades delivers because the entire brand of children's sunglasses is labeled as "virtually shatter resistant 100% UV protection lenses polycarbonate." You see, I have four pairs of my childrens' own to protect, plus I want to help safeguard all kids' eyes by contributing to public education on this topic. It's really a wonder that 75% of parents in one survey said they use sunblock but their kids don't wear sunglasses for protection. A reminder to all parents: Though summer is over and fall has begun, don't forget that UV eye protection is just as important in winter if your kids will be spending a lot of time outdoors or snow skiing a lot, like our family does. Remember that kids outside should always wear sunblock and sunglasses no matter the season, even if it is cloudy they can still get burned, literally, unless you make sure they are protected. Eyes Cream Shades are priced $34.99 - $130 per pair and include functional, sporty, and luxury styles (the later with swarovski crystal detailing) that may all be purchased exclusively online from the company's web-based store. Each pair includes an accompanying case to protect your investment and the sunglasses line comes in a range of "flavored" colors with fun style names like Cotton Candy, Blue Berry, Ocean Ice, Vanilla Bling, and more. Visit www.eyescreamshades.com or call 949-310-5859 to order from among the range of choices offered for infants (6 months and up), toddlers, kids 6 - 8 years old, and that almost-impossible-to-please-set of 8 to 12 year old tweens (and my personal favorite age stage). I like that they have infant all the way to childrens sizes and most importantly that they're UV EYE PROTECTION!! As someone who wears glasses and never really used to wear sunglasses, and my eyes getting worse every year I want to make sure I protect my DD's eyes as much as possible! A bit expensive for kids' sunglasses don't you think. After all, I don't know many kids that can hold onto the same pair of sunglasses more than one season. Unfinishedmom: I hear you; that's what my initial impression was, too, before I review the products for my reviews. But, when I actually saw and tested the product, I was convinced that the quality & durability -- considering how hard on everything my own kids are -- justified the price, which I consider to be mid-range for this category. Sure there are dollar store sunglasses and other brands for kids that are priced at or higher than the shades I reviewed. However, I'm a believer that you get what you pay for, which is why I'm a vigilant shopper for my family. On MommyBlogExpert my policy is to only blog about products I have actually tested either myself or another member of the family. Eyes Cream Shades in my own view are quality-made as well as safe for my young kid's eyes and those are the two most important characteristics I seek in this product type. Love it - those shades are cute! My ss has a shirt similar to your son. Save the trees, lol! TELL YOUR FRIENDS to enter this contest! Post a comment here for your chance to win a pair of $35 children's sunglasses from Ice Cream Shades.